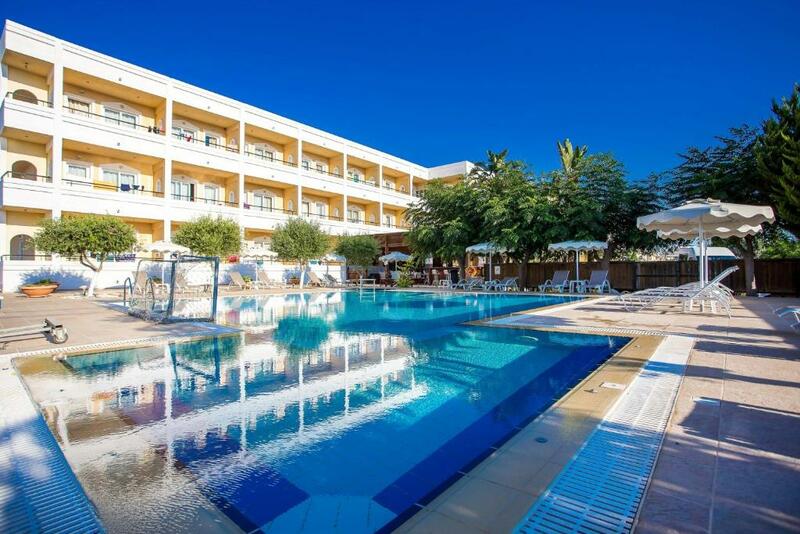 Loved the pool loved the reservation day staff very much 😊😘 Excellent breakfast Rhodes itself didn't hold as much appeal as the other 7 islands we visited but we were glad we went. Good supermarket over the road .Short walk to the town centre. Everything, the staff was absolutely fantastic, couldn't do enough for you from check in, to serving you at the bar. Don't think I've ever experienced such good service on a holiday. WELL DONE TO YOU!!!!! The location was perfect. The hotel was always very clean and the staff was absolutely kind and helpful. The supermarket on the other side of the road is a great plus. Simple eqquipped but sufficient room, close to the beach, friendly and helpfull staff, nice pool. Really good window, when you close, you can enjoy silence :-) One of best supermarkets is directly accross the street. The personnel was very friendly and helpful. The room was spacious. The breakfast quite good. 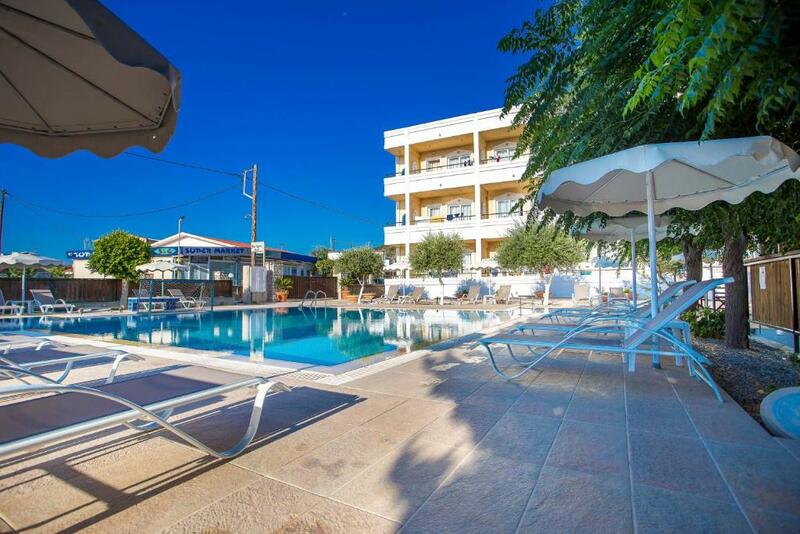 Lock in a great price for Mon Repos Hotel – rated 8.8 by recent guests! Mon Repos Hotel This rating is a reflection of how the property compares to the industry standard when it comes to price, facilities and services available. It's based on a self-evaluation by the property. Use this rating to help choose your stay! 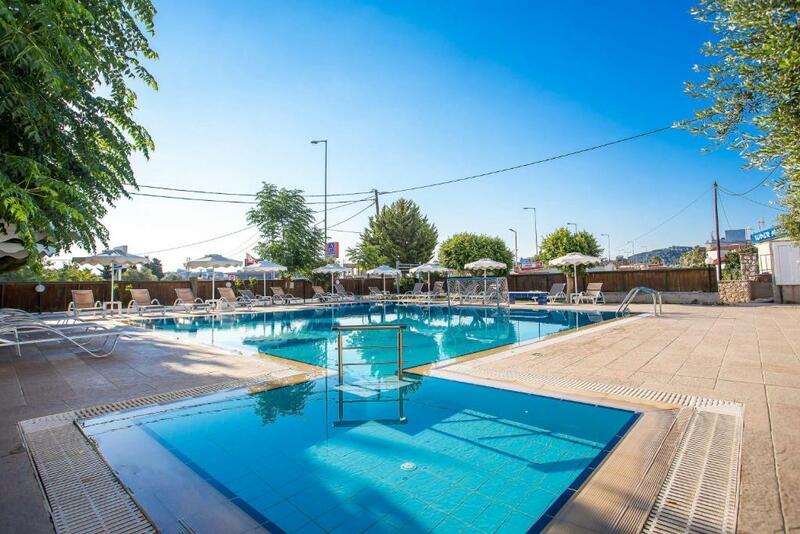 Just a 5 minute walk from Faliraki Beach, Mon Repos features a restaurant, outdoor pool with hot tub and a separate pool for children. Each spacious guest room features private bathroom and balcony and comes with air conditioning and satellite TV. Free Wi-Fi access is available throughout the premises. The Mon Repos features both an indoor and an outdoor bar, as well as a game room. 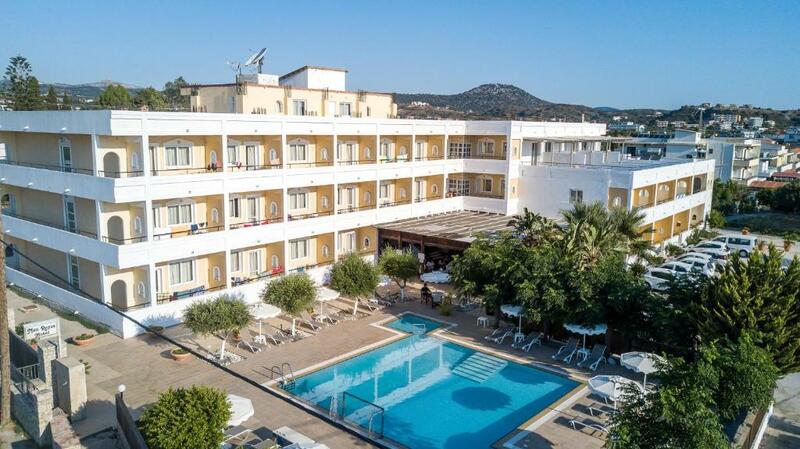 Mon Repos’s convenient location between the ancient city of Rhodes and the historic city of Lindos makes it the perfect base for exploration of the island. Mon Repos is 7.5 miles from the island’s capital and one mile from the beach of Anthony Quinn. With a 2 minute walk, guests can reach the resort’s center, where supermarkets, shops and restaurants can be found. Free parking is available. 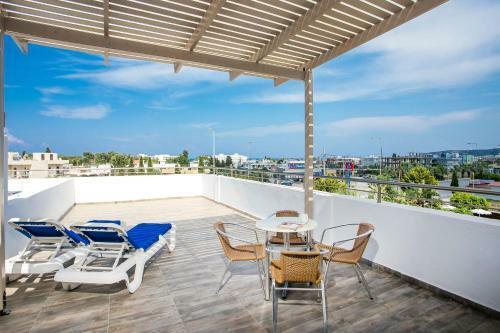 뀐 Located in the top-rated area in Faliraki, this property has an excellent location score of 8.7! When would you like to stay at Mon Repos Hotel? Some studios enjoy pool views. This spacious apartment consists of 2 interconnected rooms, large balcony and a small kitchen. 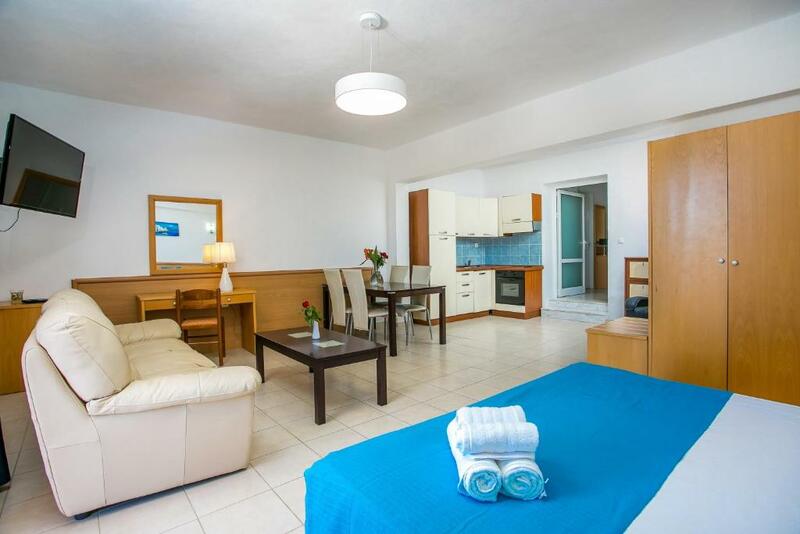 Features include air conditioning, a TV and, ironing facilities and tea/coffee maker. Το Mon Repos , απέχει μόλις 2 λεπτά με τα πόδια απο το κέντρο του Φαληρακίου και 5 λεπτά από την παράλια. Κτίστηκε το 2004 και διαθέτει σύγχρονα, Δίκλινα και τρίκλινα δωμάτια, οικογενειακά διαμερίσματα και πολυτελείς σουίτες, με πλήρη εξοπλισμό ανελκυστήρα κεντρική θέρμανση και κλιματισμό, Τηλεόραση με δορυφορικά προγράμματα, τηλεφωνική σύνδεση, εσωτερικό μπαρ, Εστιατόριο, εξωτερική πισίνα με Τζακούζι, παιδική πισίνα, εξωτερικό μπαρ ,ψυχαγωγικά παιχνίδια, παιδικό πάρκο και γωνία Ιντερνέτ. Προσφέρει δωρεάν Wi-Fi , σε όλους τους χώρους του ξενοδοχείου και χώρο στάθμευσης. Κοντά στο ξενοδοχείο υπάρχουν μεγάλα σουπερ Μάρκετ, περίπτερα, καταστήματα και ταβέρνες. Στην παραλία οι επισκέπτες μπορούν να απολαύσουν θαλάσσια σπορ ενώ στην περιοχή βρίσκεται το Water park, οι Πηγές Καλλιθέας και σε απόσταση 2 χιλιομέτρων η παραλία Λαδικό Γνωστή ως παραλία του Anthony Quinn. Η πρόσβαση προς την παλιά πόλη της Ρόδου, το αεροδρόμιο, την Λίνδο, τις επτά Πηγές και τις πεταλούδες είναι εύκολη. Σας υποσχόμαστε αξέχαστες διακοπές. House Rules Mon Repos Hotel takes special requests – add in the next step! Mon Repos Hotel accepts these cards and reserves the right to temporarily hold an amount prior to arrival. Very comfy. Really friendly staff. Not much really. The shower was a bit limited - but did the job. I would not say it is a family holiday hotel, due to the road and location BUT perfect for what we wanted - 4 day stay to meet up with friends. Size of room was nice and comfortable. Staff very welcoming and friendly. Very clean. Air con good. I stayed on ground floor facing the road but the hotel is set back so very quiet. Only a short walk to town. Hard beds! Not just here but all through Europe. The TV was basically not working (we could see only 2 channels). The wifi signal was low in the room. The road you have to cross to reach a beach is quite bussy. Air condition is time to time noisy. Kitchen is very very poorly equipped. The breakfast is good but not enough choice. I like more greek choice like orange or other local fruits. The team is very frendly. They speak several languages and french. Very good place to visit the island. All is nearly. Faliraki in may is full of animation and there is not lot of tourists. Thank you Eifthimios! I will return to see you with my familly a next time.